Cornelia Funke—the beloved and bestselling author of The Thief Lord and the Inkworld Trilogy—invites you "behind the mirror" for an once-in-a-lifetime theatrical storytelling event! Join Cornelia and special guests Lionel Wigram and Elliot Hill LIVE Tuesday, September 14th at 1:30 pm EST for the worldwide launch of Reckless, featuring a special musical performance by Adam Watts. This event is not to be missed as Cornelia takes the stage to perform a dramatic reading from her anticipated new novel, Reckless, with acclaimed stage actor Elliot Hill. Following the reading, you will witness a rare conversation between Cornelia and Reckless co-creator Lionel Wigram, executive producer of the Harry Potter movies and producer/co-writer of the Sherlock Holmes film. Together they will pull back the curtain on the creative process and give fans an intimate look at how the world of Reckless came into being. The event will also include an interactive audience Q&A session and a live musical performance by special guest, Adam Watts, who will sing an exclusive song inspired by Reckless. Storytelling, film and music combine in this unprecedented event sure to spark the imaginations of fans young and old! 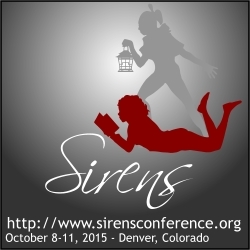 I won't be able to take a look, but I love that this combines literature, theater, and music in one event. You can read the first chapter of the book on the website. I got an e-mail the other day that had a pretty provocative subject line: THE BEST FIRST CHAPTER YOU'LL EVER READ. Now, normally, such hyperbole would make me hit the trash button pretty quickly, but as I needed to kill a minute, I opened it up. Inside was an invitation to read the first chapter of Across the Universe by Beth Revis (Penguin - Razonbill, due out 1/11/2011). To my great pleasure, this was a link to a PDF rather than a Flash site (thank you, thank you, thank you--I know it means people can keep it, but it's more manageable to access)--and to my great pleasure, the first chapter of this book was--though certainly not the best first chapter I'll ever read or have ever read--an intense and harrowing one. It's YA, so if you're a YA reader, give it a look! Oops: I forgot the link the first time around. Read the chapter here. If you're visiting here from the Book Blogger Hop, please say hi, and leave me a link to your blog! I tend to do mass follows about once a month, and giveaways once or twice a month. This is my first hop, so I'm looking forward to touring the participants! If you're visiting as usual, click the image to see the participants and their blogs. The question of the week is: Do you use a rating system for your reviews and if so, what is it and why? I don't, at present, have a rating system, and I probably won't. This is for a couple of reasons. First of all, I enjoy reading and reviewing books, even if I'm not, as I like to say, "book friends" with particular books. I like to match people with good reads! Second, I often like books, even love books, for personal reasons, and I'd have a hard time giving consistent ratings. Third, I tend to skip reviewing books unless I think they have enough value for me or for others to recommend them; it's pretty rare for me to spend time reviewing a book I really didn't like, unless I am curious why others might like the book, and then I'll review and solicit feedback. I have other reasons, too, related to occasional conflicts of interest. Instead of a rating system, I'd prefer to give a quick overview and my thoughts, and hope that I can do that in a way that's interesting. I do appreciate it when others have a rating system, though, because it means I am able to get their take on a book and keep it in mind as I read their review. I can't write about Mockingjay quite yet; I'm not sure how to hide any spoilers! But in the meantime, two recent reads, and in one more 2004 transfer, I'll be ready to move on to 2005. I had an advanced copy of this that languished and languished on my shelf. The cover on that copy wasn't anything special, and I confess that the particular design of Candlewick's advanced copies doesn't always make me excited to move a book to the top of the pile (even though I think that they're the most clear on what the book is about and when it will be released). So, at last, it was time to put a new book next to the bathtub, and I grabbed this one. What I found inside this deceptively slim book was a story with a lot of heartache, and yet one that, more than anything I've read in a long time, approaches heartache from a very real teenage perspective. Natalie and Sarah were fast friends, dreaming always of their future loves, and then Natalie's mom leaves. After that, Natalie is wrapped up in Adam, heart and body, and when she thinks she's pregnant, she finally gets on a bus and goes looking for her mother. She's not thinking clearly, but people help her through her travels, and we get glimpses into some of the heartache of the people who reach out to her. In between the everyday perils of travel, there's a solid look at friendship, first love, and family loss. A friend of mine in Australia first turned me on to John Marsden by sending a copy of So Much to Tell You, and I think she might have sent me this as well, because I have an Aussie version. It languished, too; not because I didn't want to read it, but because I simply had so many promised reads to work on. On Sunday night, I cheated on my reading list and opened the cover at 11 p.m.--and read all but the last 25 pages or so, and I stopped only because I couldn't keep my eyes open (and, well, work calls in the morning). Ellie narrates the story of a group of teenagers who gather for a last days of summer camping trip. They explore a wilderness bounded by steep cliffs, rumored to be impassable. There, in a forest, they find a hidden retreat. Just before they're ready to return, squadrons of airplanes zoom overhead--and when they emerge from the mountains, their families are gone and their town is under attack. Now, they have to decide what they're going to do, and what the consequences of action or inaction might be. The trailer emphasizes the war-as-inevitable aspect of this, though, which is something more of a dilemma in the book. And for this blog post, I've tagged it sf to mean science fiction, though I don't like that label so much; I just mean to note that this is a speculation story rather than one that's attempting to reflect what is. Whatever the film or label, I heartily recommend this book for any Hunger Games fans who need another high-stakes story to read. This last weekend, I was browsing picture books and I thought I'd recommend a few. The first is Oh No! : Or How My Science Project Destroyed the World by Mac Barnett (Hyperion). 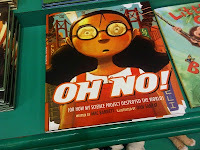 I love that this book is about a girl whose robot science project acts a little bit like Godzilla. We can all relate to a day gone wrong, right? And I love that this doesn't look quite like every other picture book city out there. 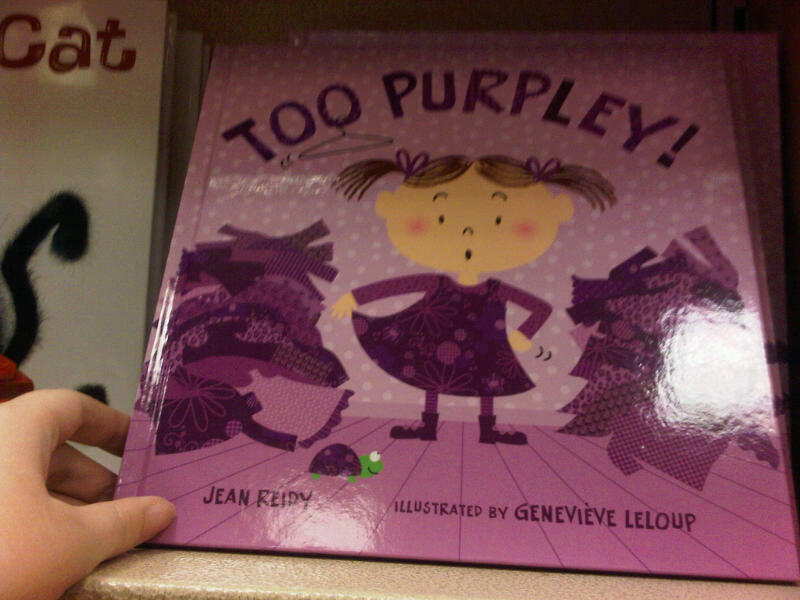 Next, I ran across a new one: Too Purpley! 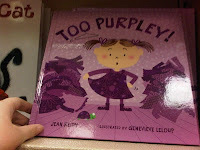 by Jean Reidy and illustrated by Genevieve Leloup (Bloomsbury). Not so far away from the very Fancy Nancy books was this one, which immediately caught my eye. And right away, our young heroine proclaims Not these clothes! For every outfit, she has a reason why it's not quite right, until she finds (and wears!) the perfect thing. At present, my friends who are wee are much more familiar with the emotions in this story than with the ones about being pretty, fancy, or princessy. And I laughed out loud gleefully--and wished I had someone to read it aloud to! 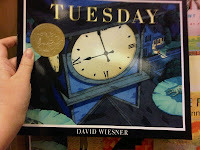 Finally, I stopped to flip through Tuesday by David Weisner (Sandpiper). This isn't a book that I would necessarily have picked up on my own, but I noticed kids gravitating toward it in school libraries years ago; it was one of those books kids of all types would try to find, and then would take off the shelf and hug tightly to their chests so that no other student could poach it before check-out time. 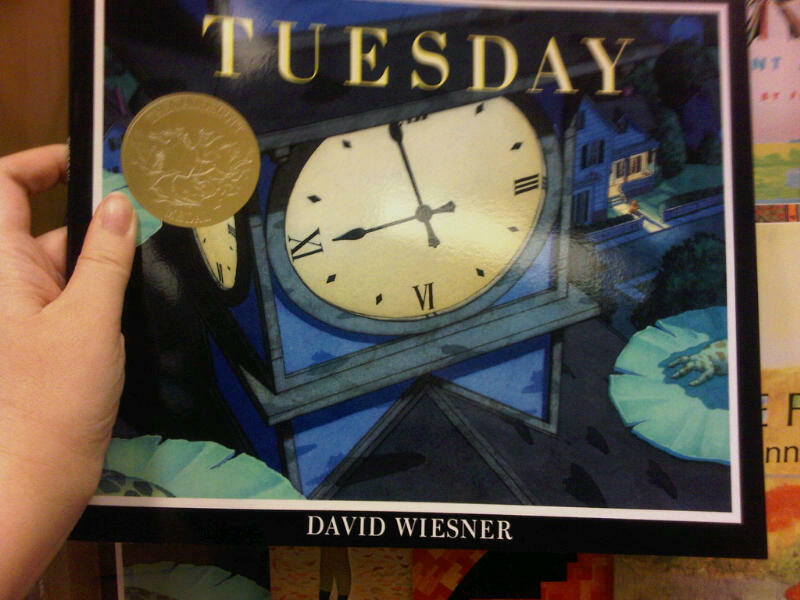 Tuesday is a somewhat surreal, beautiful book--with hardly any words at all--and I think that's why it's so attractive (that is, the surreal pictures work even if you can't read). Just when you think the world around you is completely ordinary, big toads start floating around your head. An odd Tuesday, indeed. I think that the things that must propagate have propagated, so I'm pleased to say that Read and Wonder is now Undusty. Both undusty.blogspot.com and www.undusty.com will lead you here, and everything from Read and Wonder now lives here--think of it like a URL and name change, just with the old blog being visible for a while! I'm pleased to say that this was a painless move; Blogger's tools, pages, templates, and other features saved me a lot of time. That means that I will be able to go around following more blogs, offer more giveaways (look for a Gallagher Girls signed book soon! ), and keep bringing new reviews from my archives to this blog with the time I've saved. Seussville, a new interactive site from Random House full of facts and fun about books by Dr. Seuss. One cool fact I learned: the Grinch wasn't green until he was animated. Note that this site has sounds, and not just in the video sections. Ah, nostalgia; when I was wee I had a cassette tape of Green Eggs and Ham, probably intended for a read-along, and it was so scary I cried. A lot. Also, if you'd like to win a trip to Great Wolf Lodge, there's a Magic Tree House-related sweepstakes here. It looks like people over 14 will have to be the entrants, and all entries are due by November 1, 2010. There are 5 grand prizes of a 2-night stay for a family of four in a Family Suite, waterpark passes, 2 nights of dinner and 2 breakfasts for each registered guest for the duration of stay. Travel is on your own. I don't see the entry form, but it tells you where to go to look for it. First, congratulations to Debbie D, who wins Peter and the Starcatchers, and whose pirate name is Mad Prudence. I reread this in 2004, but I've re-read this many times over the years. In some ways, it's a comfort read, and in some ways, it's a puzzle. If you asked me if I liked books about animals or with animals as starring characters (particularly animals that have language), I'd say no, but something about this is different. On top of that, when I first read this book, I was definitely in a stage where I wasn't particularly interested in male protagonists, and the female bunnies in this book aren't portrayed very well. But time and time again, I overlook my annoyances. Here's what makes this book worth reading. First, the epic journey: bunnies must leave their warren and escape danger, and find a new home. Second, and somewhat illogical: the reader knows more than the bunnies do, and the struggle for security is not quite the same as what would happen if this book starred people, so one is likely to engage with the things that do--and don't--happen along the way. Third, and maybe most important: the characters are really characters. Oh, I don't mean that they are all well-drawn and unique; some of the bunnies disappear into their supporting roles. But the ones that stand out, they really stand out. There's Hazel, accidental leader; Bigwig, loyal warrior; Fiver, tormented visionary; Kehaar, curmudgeon. They're all more than their archetypes, and considering their actions leads me to consider the actions of all sorts of people--their motivations, their fears. Oddly, I might be most likely to recommend this for fans of The Lord of the Rings and similar, given the rabbit-lore woven throughout this book and the friends-on-a-perilous-journey aspect. And, if I were you, I'd skip the movie versions, but if you're curious, you can find excerpts on YouTube. First, the good news: you still have about 30 hours to enter the book giveaway here, and all you need is your pirate name. I obtained an advance copy of this recently, and stayed up all night reading it--two nights in a row when I had class and homework due. This book starts with Four. He's changing his name, again, as he and his (effective) watcher hurry away from suspicion. In this Buffy-meets-Roswell-meets-Smallville adventure, a group of super-kids and their minders from another planet escape their home world just ahead of an alien invasion, and now they're growing into their powers here on Earth. The only problem is that alien monsters are out to get them--and no way can humans find out what's going on. Any of the group could be the next to die. If you were a fan of The Hunger Games, or if you have enjoyed recent books in the vein of The Maze Runner, or if you were, say, a fan of the TV shows I compared this to (adding, perhaps, Heroes), you'll probably enjoy this a lot. If you're a visual person, a movie is in the works already, and given the storyline, it promises to be an action film enthusiast's dream. I do have to give some caveats about this book, because while I was on tenterhooks for the first hundred or so pages, I got pretty distracted by details in the next chunk of the book. I started having questions about how many periods the students had per day, the length of the classes, the size of the high school, and the number of teachers. Hey, I used to be a teacher; I think about these things! I was really scratching my head when the characters get in a truck that hasn't been in use in eight years, but it starts up just fine. The main character and friend roll into a small college town one Thanksgiving night and there are college students all over the place, toting bags into "bookstores, coffeehouses, and bars" (that's something I've never seen on a holiday evening before!). I found the female characters--except for one who comes in at the very end, and who is the reason I'll pick up the next in the series--to be thinly drawn. There was an offhand comment about glow-in-the-dark stars being something you'd find in a tween girl's room, and I've found that those aren't stickers that only one gender likes. The character came to Earth with a big bag of diamonds and sold them all at once to set up a bank account, which strikes me as something that would have caused some suspicion, as compared to selling a few at a time. There was a series of high-stakes scenes toward the end interrupted by a lot of exposition. And I have a handful of other objections that I could detail, but I think I've made my point. Which leads me into my other point: Sometimes, if the bones of the story are good ones, I'll follow the author into another book in a series, or another standalone book. I actually really, really enjoy seeing that next book come along and I am thrilled when it's as satisfying as I predicted based on a rough-edged first book (especially when we're talking the second book, often categorized as the hardest one to write in an author's career). This book has some good bones in it, and I want to know what will come next. The flip side is bad bones. There are some deal-breakers for me. I get very annoyed when books in a series don't have self-contained stories. Even if I need to read the whole series to get the idea, I require that individual books have story arcs of their own. I don't like it when characters move around in the plot just because particular things are supposed to happen; I want to think that the plot happened because the characters were making choices all along, that everyone/everything in the book had a hand in making the events and ending happen as it did. And probably most of all, I hate it when readers are underestimated. Give me a twisty plot! Speak in realistic ways, or use language that fits the story! Have reasonable problems and reactions, rather than making a choice that wedges yourself into the next scene! Teen, tween, or two-year-olds, readers know when they're being condescended to, and they're smarter than you think. And research; I can let some things slide because it's fiction, but out-of-place details almost flipped me from happy reader to sad reader here. So, what are your deal-breakers? Has anyone else read I Am Number Four yet? First, I am pleased to say that I completed the Denver Publishing Institute! I have lots of things to catch up on, including a lot of e-mail and blogs, as well as revisiting and re-reviewing books I've read. I have a handful of books remaining from my 2004 reads, and then it's on to a mix of the greatest hits from yesterday and today, to borrow a line from radio! In the meantime, a contest open to people with a U.S. mailing address! I have a hardback copy of Peter and the Starcatchers by Dave Barry and Ridley Pearson to give away. If you didn't read this when it was first out, it's a fun take on Peter Pan. I've read it, but I'm not quite ready to post my review yet! For a chance to win, leave me a comment with your pirate name--one you make up or find on the internet somewhere. You'll also have to leave me a way to contact you; you can leave an e-mail address, but I recommend that you insert some extra spaces to prevent getting spam. If you'd like two chances to win, post a link to this contest on your blog--saying "Win a copy of Peter and the Starcatchers here!" with a link is plenty!" --and leave me a link in your comment. I'll count that as an additional comment for you when I do a random number draw on Friday, August 13, at midnight Mountain time. If you win, I'll e-mail you for your U.S. mailing address. I apologize for not being able to send books internationally!